Video Interview Blackfox Expands With Veteran Training Services by Real Time with... SMTAI Al Dill, CEO and founder of Blackfox Training Institute, discusses his company's tremendous growth over the past few years. Blackfox offers training for veterans, including a program that allows vets who pass the curriculum to secure jobs at Lockheed Martin. 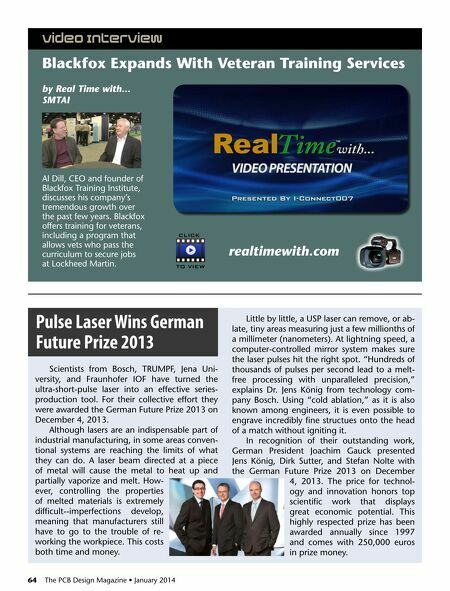 Click realtimewith.com To View Pulse Laser Wins German by Real Prize 2013 FutureTime with... NEPCON South China Scientists from Bosch, TRUMPF, Jena University, and Fraunhofer IOF have turned the ultra-short-pulse laser into an effective seriesproduction tool. For their collective effort they were awarded the German Future Prize 2013 on December 4, 2013. Although lasers are an indispensable part of industrial manufacturing, in some areas conventional systems are reaching the limits of what they can do. A laser beam directed at a piece of metal will cause the metal to heat up and partially vaporize and melt. However, controlling the properties of melted materials is extremely difficult--imperfections develop, meaning that manufacturers still have to go to the trouble of reworking the workpiece. This costs both time and money. 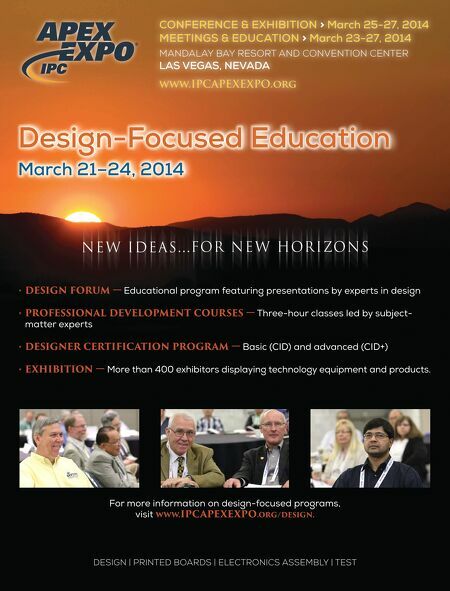 64 The PCB Design Magazine • January 2014 Little by little, a USP laser can remove, or ablate, tiny areas measuring just a few millionths of a millimeter (nanometers). At lightning speed, a computer-controlled mirror system makes sure the laser pulses hit the right spot. "Hundreds of thousands of pulses per second lead to a meltfree processing with unparalleled precision," explains Dr. Jens König from technology company Bosch. Using "cold ablation," as it is also known among engineers, it is even possible to engrave incredibly fine structues onto the head of a match without igniting it. In recognition of their outstanding work, German President Joachim Gauck presented Jens König, Dirk Sutter, and Stefan Nolte with the German Future Prize 2013 on December 4, 2013. The price for technology and innovation honors top scientific work that displays great economic potential. This highly respected prize has been awarded annually since 1997 and comes with 250,000 euros in prize money.